Gabi and Ciara are held hostage by a cartel member; Brady finds Chloe in a dangerous predicament. The leaves are beginning their annual transformation, and the air is becoming crisp -- clear signs that apple picking season is here! And you don't have to travel far to experience a centuries-old orchard with award-winning treats. This week we headed about 40 minutes outside midtown Manhattan, to the Orchards of Concklin, in Pomona, N.Y., and met Linda Concklin-Hill, whose family has owned the farm since 1712. The rolling hills there are filled with 38 varieties of apple trees. And this weekend Red Delicious apples are at their peak. Concklin-Hill described this year's crop as "big" -- and she's not kidding. Their giant Crispin apple, which more than double the size of a typical apple. She explained that their Crispins are coming "off a young tree where we got a light fruit set. And then with all the water (this year), the apple just kept getting bigger and bigger." The orchard also grows pumpkins, peaches, pears and some vegetables. On weekends, they offer a mini corn maze for the kids, a slide, and a haunted house. But keeping the family farm business alive and thriving is a huge challenge. One way to help pay the bills is to showcase their wares at some of the increasingly popular farmer's markets. That means Linda will wake up in the middle of the night, pack up her goods at two-thirty in the morning, and drive down to Manhattan for a long day of work. She usually heads to the farmer's market in Rockefeller Center, and othersin lower Manhattan. She describes the process as exhausting, but a necessity in these times. And since the 1960's, the Concklins have been growing their baking business. They make and sell apple pies, cherry pies, pumpkin pies, and many other varieties. They press their own apple cider, and make a sinfully delicious apple cider doughnut that Concklin-Hill says is ranked fourth in the nation! 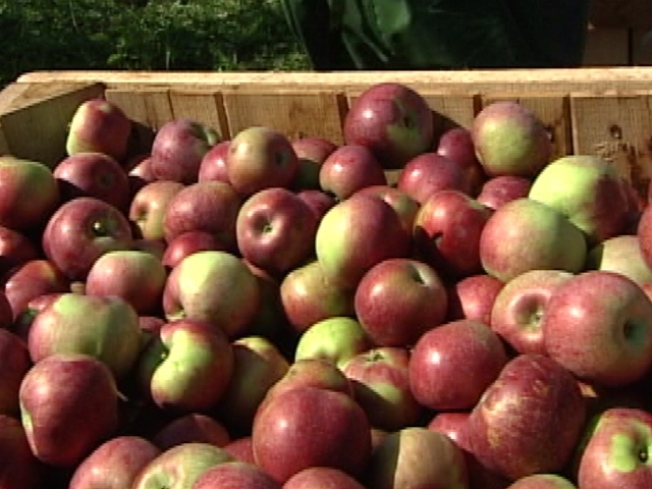 You can pick-your-own apples only on weekends -- Saturdays and Sundays from 10am until 6pm. It's a short drive from NYC. Take the George Washington Bridge to the Palisades Parkway North approximately 35 miles to Exit 12. Turn left at the the stop sign, and right at the light (Route 45 North) and the farm is a half-mile down on the righthand side. And you know what they say about an apple a day, right?